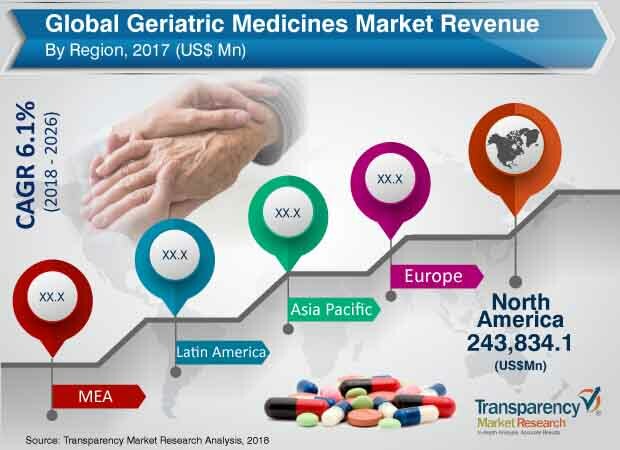 Transparency Market Research (TMR) has published a new report titled ‘Geriatric Medicines Market - Global Industry Analysis, Size, Share, Growth, Trends, and Forecast, 2018–2026.’ According to the report, the global geriatric medicines market was valued at US$ 630,225.2 Mn in 2017. It is projected to expand at a CAGR of 6.1% from 2018 to 2026. Aging population and longer life-expectancy, increased awareness, and acceptance of advanced therapeutics are some factors that are likely to drive the geriatric medicines market from 2018 to 2026. Technological advancements for medication assistance and increase in government support for elderly have fuelled the geriatric medicines market in the last decade. The Federal Long Term Care Insurance Program in the U.S. is a favorable policy for the elderly people, which covers almost all medical care/cost of people in the U.S. Likewise, the Long Term Care Ombudsman Program provides nursing homes, residential care facilities, and assisted living facilities for elderly people in the U.S. Moreover, developing nations, such as India, China, and South Korea, are adopting policies and services for the benefit of elderly people. Therefore, the geriatric medicines market is likely to expand at a significant growth rate from 2018 to 2026. The report offers detailed segmentation of the global geriatric medicines market based on therapeutic category, condition, distribution channel, and region. In terms of therapeutic category, the analgesic segment accounted for a dominant share of the market in 2017. According to the U.S. Census (2013), around 40 million people over the age of 65 were suffering from joint pain and arthritis. More than two-thirds of the geriatric population suffered from multiple chronic conditions, and treatment for these conditions accounted for around 66% of the health care budget of the U.S. (Centers for Disease Control and Prevention, 2013). The hospitals pharmacies segment is expected to account for a leading share of the market by the end of 2026. The segment is also likely to expand at a rapid pace during the forecast period. Hospital pharmacies act as a profit-earning arm of major hospitals. Several hospital conglomerates run their own pharmacies. Furthermore, they have strategic tie-ups with third-party players to run pharmacies in the premises. Expanding base of hospitals and surge in the number of hospital visits for treatment of various chronic disorders are anticipated to drive the hospital pharmacies segment during the forecast period. North America held a major share of the global market, in terms of revenue, and is expected to maintain its position during the forecast period. North America is home to several key market players, such as Pfizer, Inc., Merck & Co., Inc., Bristol-Myers Squibb Company and Eli Lilly and Company, which have their headquarters in the U.S., where they generate significant sales. Hence, North America is a leading market for geriatric medicines. High awareness about latest health care technologies and higher purchasing power are anticipated to boost the geriatric medicines market in North America. Moreover, large percentage of obese population susceptible to chronic diseases is likely to further fuel the market during the forecast period. The geriatric medicines market in Asia Pacific is expected to expand at a rapid pace, primarily due to improving health care infrastructure, rising disposable income, and technological advancements in countries such as China and India. The report also provides profiles of other major players operating in the global geriatric medicines market. The other major players include Bristol-Myers Squibb Company, Novartis AG, Sanofi S.A., GlaxoSmithKline plc, Eli Lilly and Company, Abbott Laboratories, and Boehringer Ingelheim GmbH.